The trip has Vietnam’s most popular sites rolled into one. Visit the historical sights of Saigon, Hanoi, Hoi An and Hue” plus take a dragon boat cruise along the Perfume River; spend the night on a junk boat in Halong Bay and take sampan cruise through the Mekong Delta. – Saigon, the second largest city in Vietnam and also its commercial capital, visit all interesting sites and landmarks in Saigon City such as : Notre Dame Palace, War Remnants Museum, the Reunification Palace, free time your at leisure at Ben Thanh Market, discover the bustling city of Saigon. – Enjoying a boat rice on the Mekong River, visit an orchard on an island, discover 2 big floating markets: Cai Rang and Phong Dien, discover a typical way of displaying and advertising farm products of local people. – Visiting the former French colonial hill station town of Da Lat, dicover Lat Village – a local ethnic hill tribe community, visit the Summer Palace of the last emperor of Vietnam, take a scenic train ride to Trai Mat. – Have the chance for swimming and snorkeling in the crystal clear waters, relax on the beach of for the energetic in Hon Mun Island, Hon Tam Island, visit the Po Nagar Towers, an outstading of ancient Cham Architecture. – Discover Halong Bay – one of the seven wonders of the world with beaches, grottoes and beautiful caves. Our representative/tour guide will meet and greet you at the airport. Transfer to the city for hotel check-in. Free at leisure to make your own exploration to discover the bustling city of Saigon. AM: Leave Saigon for My Tho. My Tho is located on the northern banks of the Mekong river and is the closest town in the Delta area to Ho Chi Minh City, about 2 hours drive away. In the center of the town close to the river there is a large market that sells just about anything that can be eaten or is used in day to day business. Around the My Tho area you will find a maze of small canals that can be explored on one of the many organized boat tours. Enjoy a boat ride on the Mekong River and visit an orchard on an island, with lunch en route. PM: Continue with a visit to a snake farm and then continue driving to Can Tho. Check-in hotel. AM: Early morning board for a 3-hour cruise to Cai Rang and Phong Dien, 2 big floating markets with stops at a Bun Tau noodle factory and a short trek before arriving at a rice-husking mill. You can even try passing one of the many fragile monkey bridges along the canals photo shot. At the floating markets, you will discover a typical way of displaying and advertising farm products of local people gathering on the Mekong river to trade their goods. PM: Drive back to Saigon with a lunch stop at My Tho. Back to Saigon in late afternoon. AM: In the morning, the tour guide will pick you up at the hotel and today you will visit all interesting sites and landmarks in Saigon City. First stop is Notre Dame Catholic Cathedral and short visit to French built Post Office nearby, and then we will proceed to see the Reunification Palace, formerly the Presidential Palace governed by the US-pro government of Republic of Vietnam. Touring the building and then we will visit the War Remnants Museum, which primarily contains exhibits relating to the American phase of the Vietnam War. Break time for lunch. PM: In the afternoon, we drive to Cu Chi district, 50 km to the Northwest of Saigon City, The tunnels of Cu Chi are an immense network of connecting underground tunnels are part of a much larger network of tunnels that underlie much of the country. The Cu Chi tunnels were the location of several military campaigns during the Vietnam War, and were the National Front for the Liberation of South Vietnam’s base of operations for the Tet Offensive in 1968. Touring the areas and then you will be transferred back to Saigon. Free time at leisure or shopping at Ben Thanh Market nearby. Overnight at hotel in Saigon City. AM: A short flight takes you to Da Lat City – The former French colonial hill station town of Da Lat was founded over 100 years ago by a French scientist, Dr Alexander Yersin. PM: In the afternoon, we will visit the Summer Palace of the last emperor of Vietnam, Bao Dai, and Hang Nga Guesthouse, known as the ‘Crazy House’ to locals because of its bizarre architecture. You may also wish to pay a visit to one of DaLat’s most notable residents, Buddhist monk/artist, Vien Thuc. AM: Another sightseeing option is to take a trip out to ‘Lat Village’ – a local ethnic hill tribe community located just outside Da Lat. AM: We will head eastward, making our way towards the coast. We’ll pass through pine forests and small market garden communities before reaching the top of Ngoan Muc Pass where we begin our 18 kilometer descent down to the coastal plains below. If you look to the left from here you may see where the old rack and pinion railway made its way down the range. Looking forward, you may just be able to make out the coastline situated 50 kilometers in the distance. A little over midway on the drive we arrive at the twin towns of Thap Cham and Phan Rang. The literal translation of Thap Cham is ‘Cham Tower’ and there’s a fine example of one here in the form of 13th Century Po Klong Garai. PM: We will reach to Nha Trang City in the afternoon. AM: Experience the coast of Nha Trang aboard a boat as you set out in the morning for the first stop at the Tri Nguyen Aquarium. You will then head out to Hon Mun Island where you have the chance for swimming and snorkeling in the crystal clear waters. From here, continue to Hon Tam Island where you have the choice of relaxing on the beach or for the energetic – there is a choice of water sports. Lunch stop is at the fishing village of Lang Chai where there is time to explore before boarding the boat back to Nha Trang harbor. PM: If time permits, we will visit the Po Nagar Towers, an outstanding of ancient Cham architecture and then touring around Dam Market before transfer you back to the hotel. At Leisure. AM: At Leisure and then you will be taken to the airport in Nha Trang to take 1 hour flight to Danang City, famous for China Beach and the former R&R for US servicemen. Pick up upon arrival and transfer to Hoi An. PM: Visit the fascinating Cham Museum, famous China Beach and the Marble Mountains en route to charming Hoi An. Hoi An Ancient Town is an exceptionally well-preserved example of a South-East Asian trading port dating from the 15th to the 19th century. Its buildings and its street plan reflect the influences, both indigenous and foreign, that have combined to produce this unique heritage site. At leisure for the rest of day. AM: Known as Faifo to early Western traders, Hoi An was one of South East Asia’s major international ports and today it still retains that special old-world feel. Enjoy a walking tour through the Old Quarters to see the town’s landmarks of Japanese Covered Bridge, ancient Assembly Hall, Phuc Kien Temple and then we take a river trip and you will enjoy the scenery along the Thu Bon River and the general view of Hoi An Ancient Town. PM: Visit ceramic village of Thanh Ha, carpentry village of Kim Bong and Dai Chiem Estuary. Hoi An is also famous for its large number of tailor shops, so if you want to have a new wardrobe made up, this is the time to do it. AM: This morning we drive to Hue, we will cross Hai Van Pass where you will have magnificent view of the China Sea. Stop at Lang Co to have break. Check-in hotel in Hue City and we will take sightseeing tours to see ancient Imperial City, Royal Palace. PM: The rest of time you will be free for shopping at Dong Ba market. AM: Take a dragon boat trip along the Perfume River visiting Thien Mu pagoda. PM: Continuing on to the Royal Mausoleum’s of Tu Duc and Khai Dinh. This evening fly to Hanoi. Pick up upon arrival and transfer to the city for hotel check-in. 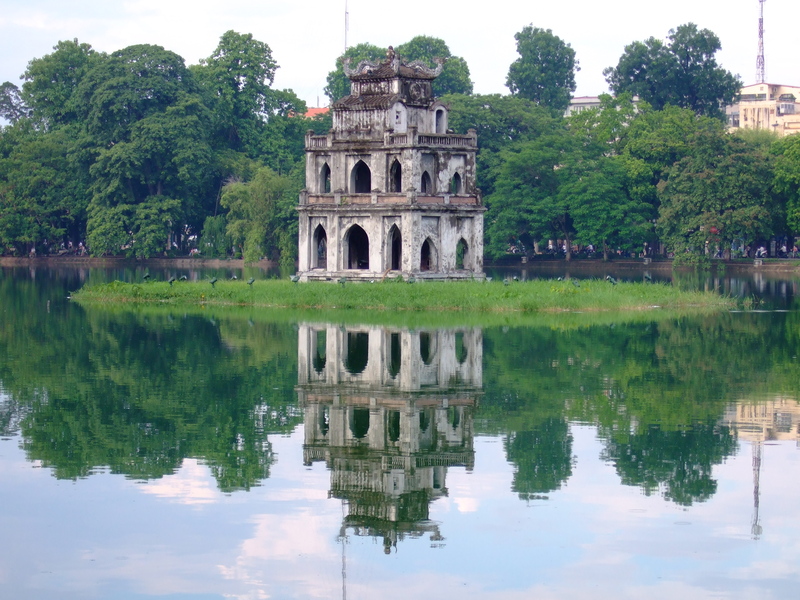 AM: Enjoy 5 hour sightseeing tours to visit the city’s landmarks such as Ho Chi Minh Mausoleum, One Pillar Pagoda, The Temple of Literature (First University built in the 11 Century), Hanoi Hilton Museum. PM: Free walking around Hanoi old quarter for shopping and short visit Dong Xuan market. Enjoy 1 hour cyclo tours around the Hanoi City’s old quarters and the traditional water puppetry show. Transfer back to your hotel. AM: Morning depart for Halong Bay, we go through the scenic countryside. The wondrous Halong Bay is truly one of Vietnam’s most impressive scenic sights. Heading out of the town we embark on a boat for an exploration of the legendary Halong Bay. PM: This exciting five hour cruise will provide us a fantastic view of the picturesque scenery blending with the sky and some 3,000 limestone islands rising amazingly from the clear and emerald water. The limestone karsts formations are littered with beaches, grottoes and beautiful caves. Along the way we will anchor for a leisurely swim in a secluded cove and an enjoyable visit to one of the many hidden grottoes beneath towering cliffs. AM: Waking up and having breakfast served onboard. Continue cruising around the bay. Take sampan to visit Luon Cave and come back to the boat. Having brunch before disembarking and van will pick you up at the pier and transfer back to Hanoi. PM: Visit Dong Trieu ceramic and pottery village on the way. Arrive in Hanoi at 04:00 pm. Free at leisure. Free at leisure until transferring to Hanoi airport to take departure flight. HOME SWEET HOME. End of Vietnam Fantastic Tours service. – International air-tickets and airport departure tax.